Image area: Trim area minus .125″ on all sides? 1. 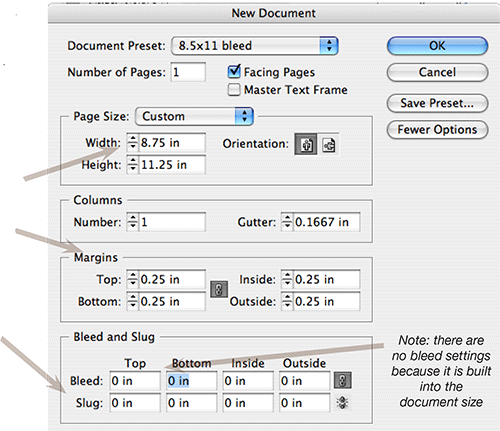 Set up the document to the bleed size. 2. Set your margin guides so that it will be the live area. All graphics and text that you don’t want to be cut off must be within the margin settings. 3. Ignore the bleed settings as the document is set to the bleed size. 4. Finished Pdf should be the document size without any crop marks or excess white space on the outside edges of ad. All multi-page print products MUST include page folios and should be built as single pages with the exception of the center spread and have no cropmarks. Place Page number within the document image area, Even pages on left, Odd pages on right. Photos should be 200 resolution and line art should be 700 resolution. No Crop Marks or excess white space should be on document.